The fire at Grenfell Tower is an event that has had impact beyond the administrative boundaries of Kensington & Chelsea. Rather, it has held continued national importance for local authorities across the country. In the days, weeks, and months following the tragedy, local authorities with high-rise residential tower blocks have been working to examine, assess, and act on their own positions relating to the safety of the tenants in these properties. This blogpost hopes to provide an insightful narrative to some of the challenges faced by local authorities in relation to their social housing stock, and their responses to local and national developments following the Grenfell Tower fire. It will do this by drawing upon my observations from a six-month placement I completed at Bristol City Council last year, as part of my PhD research examining Planning Law and the Housing Crisis in Bristol. In the days following the fire at Grenfell Tower, the immediate guidance from central government to local authorities came through the Department for Communities and Local Government (DCLG), which took the form of guidance letters and followed two main themes. Firstly, focus was placed on the identification and testing of ACM cladding – the principal material immediately recognised as significantly contributing to the extent of the tragedy at Grenfell Tower. Secondly, the government advised local authorities to ensure that residential fire risk assessments were robust and up-to-date. While the assessment and testing of ACM cladding was visibly a key priority, there was a significantly escalated public interest in fire safety in high-rise properties. Residents in these properties, and residents across the nation, needed reassurance as to the safety of their homes and, as the owner of these buildings, this was the responsibility of local authorities. The first of the guidance letters came on the 18th June 2017, four days after the Grenfell Tower fire. The DCLG wrote to local authorities and housing associations asking them to survey and identify new-build or refurbished properties which had ACM cladding. Further, where these surveys did determine ACM cladding to be in use on local authority or housing association residential properties, local authorities were asked to verify a sample through the testing processes established by the DCLG. This letter reiterated the testing of ACM cladding as the key priority, but it also sought to remind local authorities that “they should be well advanced in checking they have robust fire assessments for their stock”, advising that local authorities follow the Local Government Associations Fire Safety in Purpose-Built Blocks of Flats guidance for ensuring fire safety in high-rise residential buildings. It observes that assessments carried out to comply with fire safety law contained within the Regulatory Reform (Fire Safety) Order 2005 would be “unlikely to have considered the building’s cladding” and so highlighted again the importance of verifying the cladding material through the testing process. On 22nd June 2017, a second letter was sent from the DCLG to local authorities and housing associations. This guidance provided a list of interim measures recommended by an independent panel of experts if it was determined that the insulation within ACM cladding was unlikely to comply with fire safety standards. These measures ranged from ensuring that recommendations from an up-to-date fire risk assessment had been completed, fire detection systems were fully operational, and residents were engaged with to ensure that they understood the emergency fire procedures in the building, to checking that combustible materials (e.g. refuse) were not stored within the vicinity of the cladding. In the cases of most serious risk, the DCLG advised that local authorities should consider moving all residents out of at-risk properties until satisfactory remedial work had been completed. 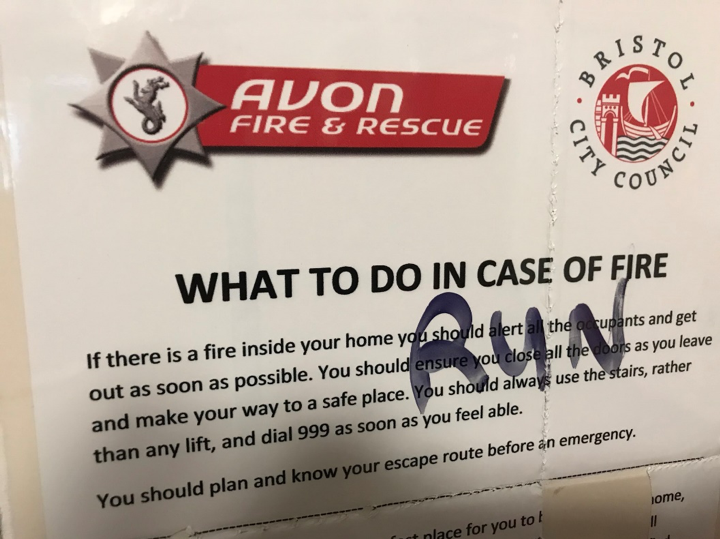 For Bristol City Council, proactive action was taken in the light of increasing national and local media attention, by working alongside Avon Fire and Rescue Service in a series of responses. The guidance from the DCLG discussed above provided confirmation of the appropriate actions being undertaken. As directed by the DCLG in the two letters of guidance, the foremost response was the identification of council-owned buildings with ACM cladding. The 2011 Census, although increasingly out of date, provides the most reliable picture of housing tenures within Bristol, with 21% of residential properties socially rented in the city – 15% owned by the city council, and 6% by housing associations. Within this, there are 59 high-rise residential towers in Bristol owned by the local authority, housing around 10,000 people in total. Following necessary surveys and identification of residential council-owned towers with ACM cladding, none of the residential council-owned tower blocks were found to have ACM cladding. However, given the increasing public concern about fire safety, Bristol City Council’s responses to the Grenfell Tower fire were not complete. The local authority’s response to satisfy residents’ perception of fire safety in high-rise tower blocks – their homes – has remained of great importance. In aims to provide reassurance to tenants, representatives from Bristol City Council worked alongside Avon Fire & Rescue Service to visit and meet residents of all 59 local authority tower blocks. In doing so, tenants were assured that all the local authority tower blocks had up-to-date Fire Risk Assessments, and, moreover, that the local authority was taking their safety seriously within a context in which the public were understandably concerned about fire safety in high-rise blocks. This notion of increased public interest in the safety of high-rise living was also apparent in our research for Shelter and subsequent report, Closing the Gaps (co-authored with Helen Carr, David Cowan, and Edward Kirton-Darling), where the response rate and answers from occupiers demonstrated substantial interest in having their voices heard about their health and safety concerns in high-rise properties. Of the 940 respondents to an online questionnaire, over two-thirds were occupiers – whether owner-occupiers, social tenants, or private tenants. Within the survey, respondents were asked a series of questions about problems and health and safety concerns with their properties. In their responses, occupiers highlighted ongoing concerns with fire safety, particularly: inaccessible emergency escape routes, failing smoke detectors, fire safety doors and compartmentalisation, and the safety of exterior cladding. In the face of mounting pressure from local authority residents in Bristol, in addition to calls for retrofitting sprinklers from MPs and media coverage of prominent figures like the London Fire Brigade Commissioner, the feasibility of retrofitting fire suppression systems (sprinklers) into each residential flat was also explored by Bristol City Council. While the local authority supported such measures, they were faced with the challenge of finding the expenditure to install such systems. Initial estimates placed the costs at around £250,000 per block, £15 million for all 59 local authority high-rise tower blocks. Austerity measures being implemented by central government are having a particularly acute impact on local authorities, which meant that providing £15 million for retrofitting sprinklers was a difficult, if not impossible, challenge. This was experienced across the country, with calls from local authorities for central government funding to implement such fire safety measures. However, these calls were quickly rejected. In a letter from Sajid Javid (then Secretary of State for Housing, Communities and Local Government) in July 2017, the DCLG made it clear that local authorities – as the building owners responsible for tenants – must fund measures designed to make a building fire-safe by drawing upon existing resources to do so. Over a year on since the fire at Grenfell Tower, sprinkler systems are yet to be installed in Bristol City Council residential tower blocks. This is not due to an unwillingness or a lack of desire, but principally because of the financial obstacle of doing so. Nevertheless, Bristol City Council and Avon Fire and Rescue Service continue to review and improve the fire safety in high-rise and low-rise blocks across the city through alternative fire safety measures. This blogpost has sought to provide a brief narrative of some of the immediate guidance and responses for Bristol City Council which unfolded following the fire at Grenfell Tower last year. While national media focus concentrated on the infamous scenes of the flammable cladding, the results from surveys showing an absence of ACM cladding on any of Bristol’s local authority residential towers did little to relieve concerns for residents. Thus, this increased public perception of substandard fire safety in high-rise living has required action from the local authority to verify, reassure, and resolve concerns wherever possible. Yet, while the pinnacle response sought from residents was the retrofitting of sprinkler systems in their homes, without central government financial support to provide such measures the possibility of actioning this remains unlikely. Burtonshaw-Gunn, E. (2018). Local Authority Responses to Public Perceptions of Fire Safety: Insight into Bristol City Council. Available at: https://www.law.ox.ac.uk/housing-after-grenfell/blog/2018/08/local-authority-responses-public-perceptions-fire-safety (Accessed [date]).